For users not satisfied by Windows internal backup capabilities, these are many third-party solutions for data safekeeping, both free (requiring no payment) and shareware (requiring a payment after a trial period or for extra functions only). 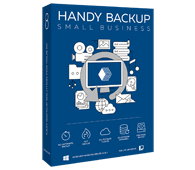 Handy Backup is a perfect example of shareware utility with a period of 30 days during which time no payment is required for all the functions the software package have. If a user looking for a free alternative of Windows backup built-in tool, some considerations must be taken into account. Let us define some of these considerations here. Truly “free” alternative of Windows backup is an uncommon thing, so when the term “free” is defined accurately. By precision, all software may be sorted for the four categories according to the type of licensing and payment. Open-source software is completely free from any prices and fees, and the source code of this software is not subject to any copyright or protection law as well. Any user can freely modify, use and re-distribute software solutions belonging to this type. Free backup software requires no pay for use but can be protected from other commercial and private usage, having authorized source codes, registered trademarks and so on. Some software packages of this type are free for individual usage but commercial customers must pay for it! Shareware solutions can be used freely at limited time and/or functionality, after that the payment is required for unblocking. The most popular sort of shareware model is a trial period provided for learning and accustoming the program. Paid or commercial programs strictly require immediate payments for purchasing and using. It is a most widely distributed model on software market. So if you need a free alternative of Windows backup you can select between the three methods described firstly. As truly free alternatives of Windows backup internal tool can be more affordable, some reasons can give shareware solutions a hand over other types of commercial models. Handy Backup allows you to see and learn all functions of backup, restoration and mirroring provided by this package and made a final decision after this period of studying capabilities. To back up and restore your Windows OS, you need to use the Small Server edition. Free 30-days trial version! It is to be mentioned some advantages of Handy Backup over most free alternatives of Windows backup. These advantages includes a possibility of viewing backups in the native formats of stored source files, wide functionality in an area of network-based backup and strong, all-time tech support of the product. The shareware model of Handy Backup guarantees more customer quality than any free or open-source backup solution available on market today.